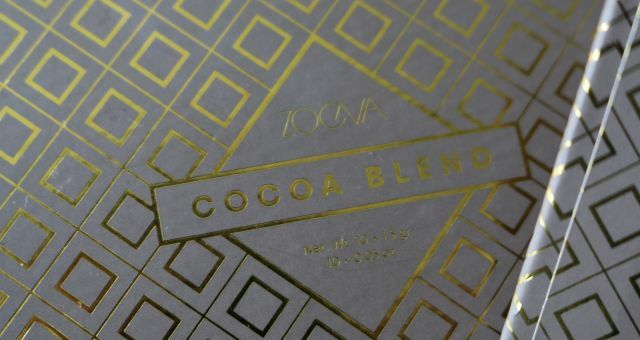 Although, my first impressions of the palette are quite good, I would say that this is not a palette with perfect quality and pigmentation specially compared to the previous chocolate bar palettes. But overall, I would say the quality is decent enough, the colours are very pretty and it is quite a lovely palette if we don’t get over critical. As many other palettes, this to has some minor flaws which need to be worked on a little more. 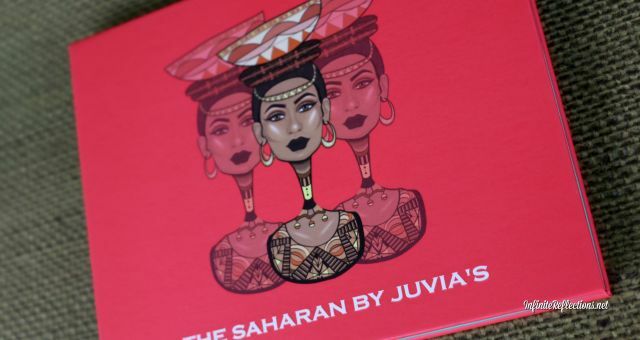 The packaging for this eyeshadow palette is one of the bests I have seen. 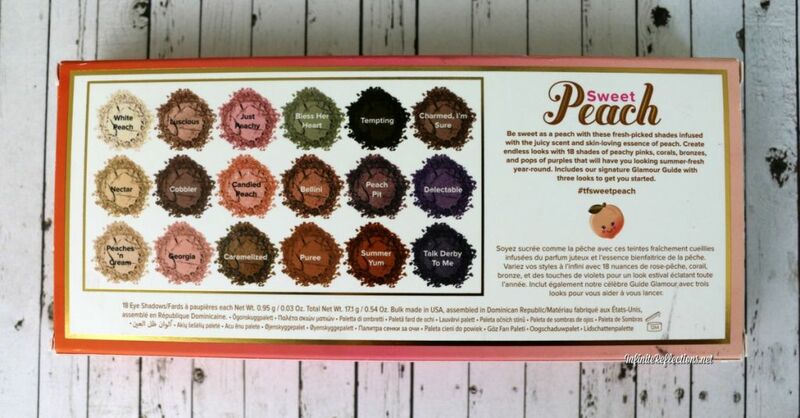 The colour scheme is so pretty and I love how the peaches have been incorporated in the whole design. They have a raised embossed look on the tin eyeshadow palette. 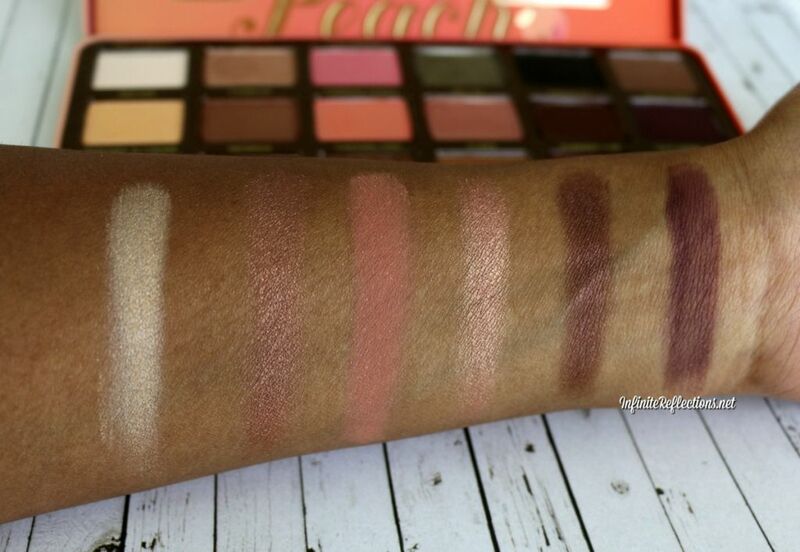 The core body of the palette is very similar to the chocolate bar palettes. It is a very sturdy tin packaging and it is one of my favourite packaging types. This is very travel friendly. The pink and gold colour scheme on the palette and its entire collection is really very pretty. 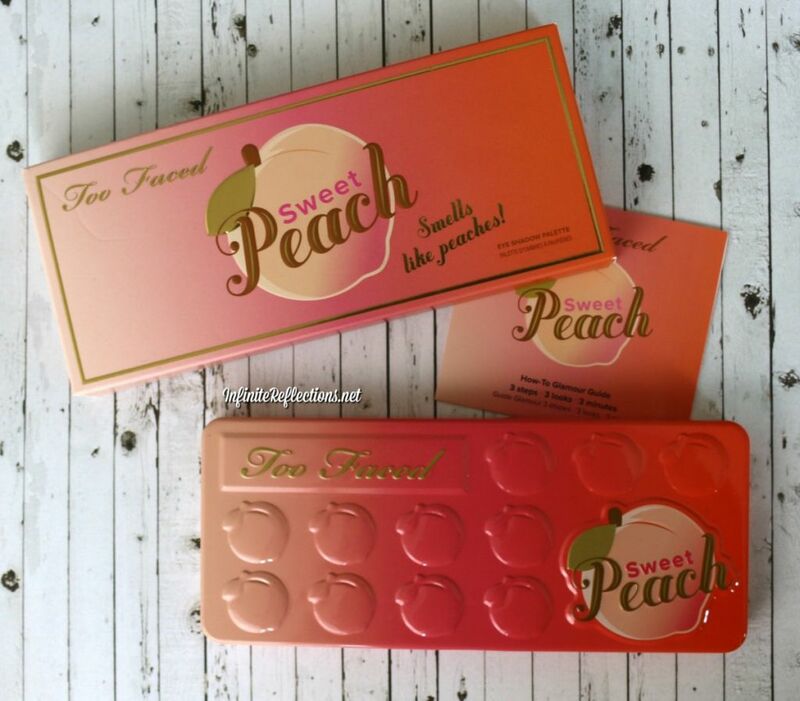 When you open the palette, there is an overwhelming scent of peach. Honestly, the scent is too sweet for me and I don’t really like peach scent. But, that’s just me and many people do like it. 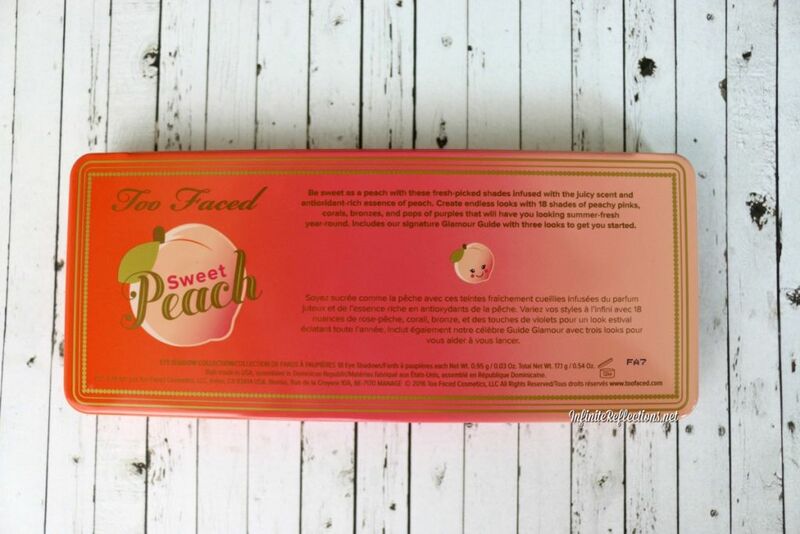 Each shadow is claimed to be infused with peach oil which is full of anti-oxidants, which is an interesting ingredient. 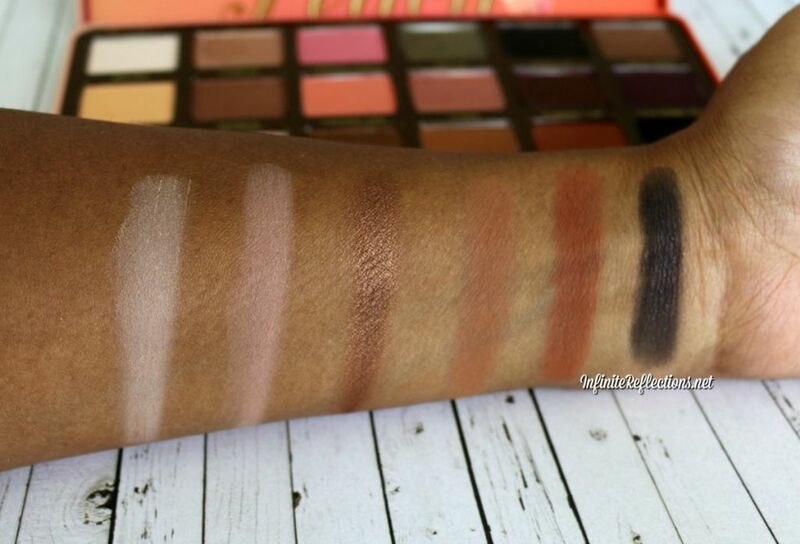 The mirror size is also pretty similar to the chocolate bar palette, the size is quite small but workable. 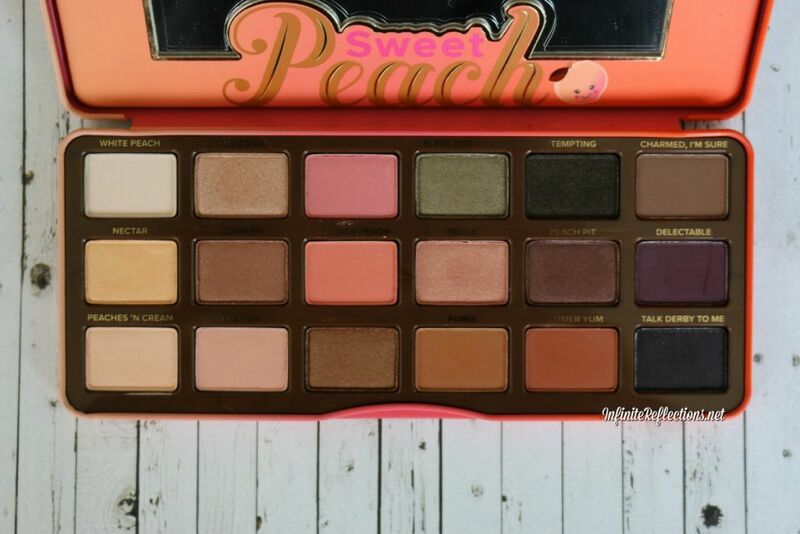 The Too Faced Sweet Peach palette comes with 18 shadows and unlike the chocolate bar palettes, there is no bigger highlighting pans in this one. A highlighting palette has been launched and sold separately. Each shadow is 0.95 gm / 0.03 oz. 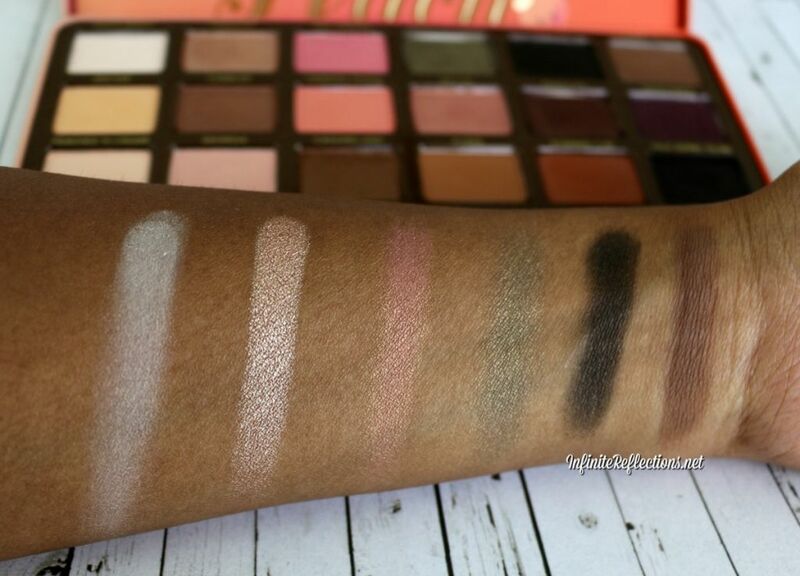 The shades of this palette are really pretty ranging from pinks, corals some bronze and a pop of purple tones. I really like the shade range. Many people complained that the shade range is not peachy enough but I quite liked it and feel that it is a well thought out palette. This will very well work well deeper / tan skin tones like mine since all the shades are not light and there are some deeper shades as well. 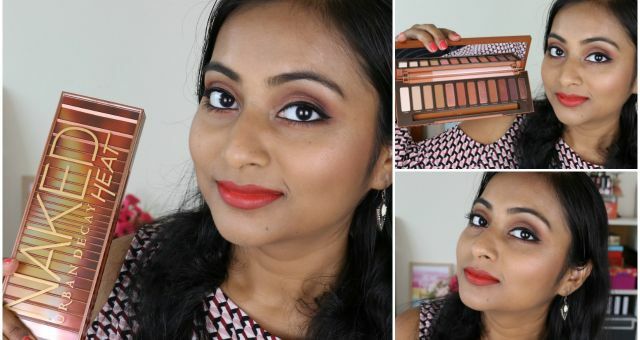 I feel that the pigmentation of this palette is quite hit and miss. I would say, not really a miss but some shadows are not that intense as they appear to be and some other need to be really worked upon to get blended nicely. There are 5 matte shades in the palette and the rest range from satin, shimmer, frosted to metallic. Overall, the matte shades are pretty decent quality. They are not absolutely soft and buttery but the pigmentation is quite good and there is no problem blending them. One or two feel a bit chalky in the pan while the rest feel a little bit better. So, all of them are not consistent in their quality. But, nevertheless the range of shades for the matte is pretty nice, all of them are pretty neutrals and they do work quite well. There are probably 3 shades in the palette with a satin finish, where there is a tiny bit of a sheen to them. Only 1 of them (“White Peach”) is good quality, the other two (“Delectable”, “Talk Derby To Me”) which are deeper shades, feel very chalky and were quite difficult to blend out. I was quite disappointed with these two shades since I was quite looking forward to them but the quality doesn’t match my expectation. The rest of the 10 shades have a variety of finishes. There is a very gorgeous metallic shade, some few shimmers, some have a nice frosted sheen to them and some also do have tiny flecks of shimmers in them. Overall pigmentation is good, nothing much to complain. But, I would have wanted few shades to be more intense and have more payoff. Some look quite intense in the pan but they are not that intense when applied over the eyelid and have a tendency to sheer out. “Luscious” is amazing quality, you can see in the swatches. I was disappointed with “Bless Her Heart”, the olive green shade, it is not very intense. The pink “Just Peachy” and the peachy-orange shade “Candied Peach” are quite nice and are one of the few shadows matching the theme of the palette. 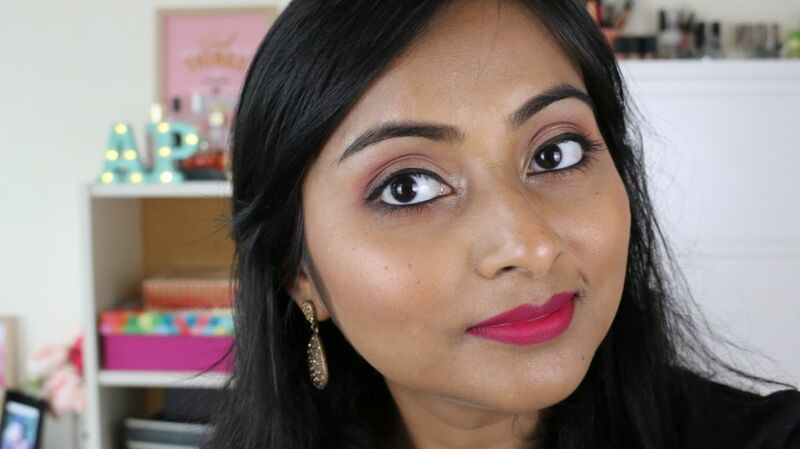 I love “Bellini” which is almost a duo-chrome shadow and looks really nice all over the eyelids. The rest of the shades are shimmer finishes almost frosted, and are quite nice. The pigmentation is good and the colour payoff is also nice but I feel like I already have similar shades in my Chocolate Bar palettes. It is priced at SGD 76 here is Singapore. 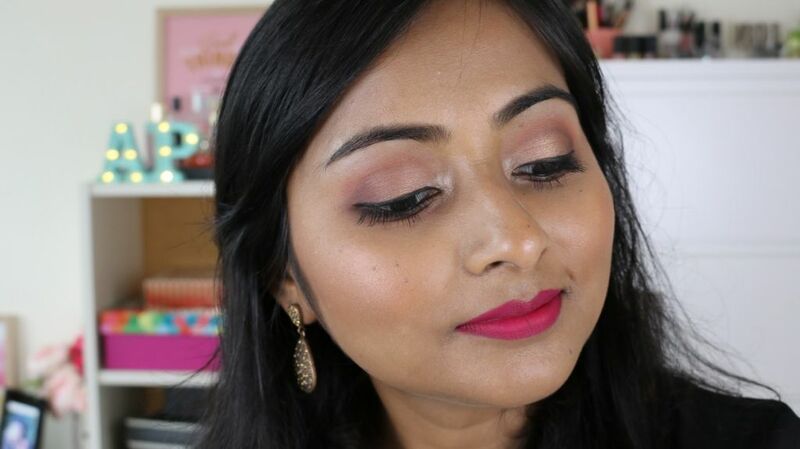 This is one of the looks I created with the pink and berry shades. I always do very neutral wearable looks and I really liked how this one turned out. 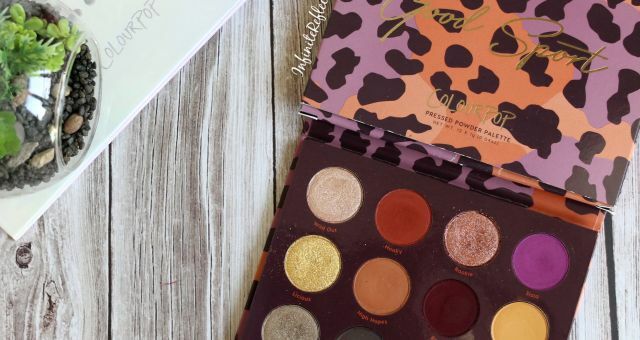 I would say overall, the shades are good and the shadows are pigmented enough that you would be happy with the purchase but you also need to remember that some shadows have flaws too and you will have to work on them a bit harder. So, this is a good spring-summer palette but don’t expect anything extraordinary. The shadow quality is good not amazing but the shade range is quite good that you will be able to do quite a lot looks. I hope this review was helpful. Do let me know in the comments section below. 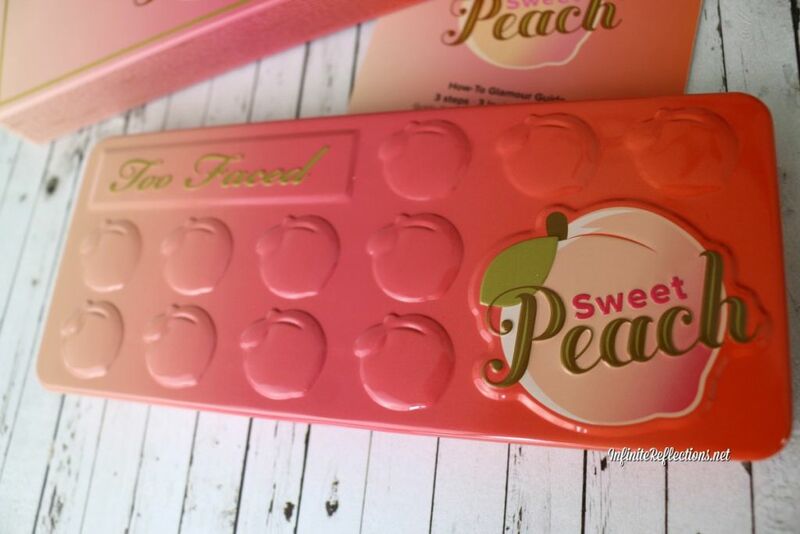 Watch my review on the Too Faced Sweet Peach palette on YouTube.